KlezNorth is an annual festival of Klezmer music, dance and song welcoming both Jewish and non-Jewish people to the wonderful world of Klezmer. KlezNorth is based in Derbyshire, but in this context, “North” regularly includes the Midlands, the Southwest, Wales and Scotland, the North East, East Anglia, and, dare we say, London and the South East. We have a few overseas participants as well. Over the years, we have kept the size the same, enabling us to retain the huge advantages of being based in Youlgrave – a wonderful location, low cost and self-contained… and beautiful too! We have also been able to retain the ethos of doing things ourselves; it is very much a participant event, but also each year have been able to supplement our home-grown tutors with people of national and international renown. In 2009, Sue Cooper with Adrian Dobson and Judith Plowman, drew up sketchy plans for a Weekend of Klezmer in Youlgrave in Derbyshire in 2010, imagining about 30 people. As the number applicants grew to fifty and then 100, so the organising group grew. We have been fortunate in having a fabulous range of in-house workshop leaders who gave their time for free in the spirit of KlezNorth. KlezNorth 2010 proved a great success, with Klezmer music, dancing, and Yiddish song firmly established as the three core strands, together with reflections of other aspects of Yiddish culture. The decision was made to do it again, and especially to continue with its principles, being based on affordability for all, on being ‘self-financing’, and having no entrance criteria but an enthusiasm for Klezmer! So a new tradition was born. In 2010, Ros Hawley of the DeliBabies from Manchester headed up our team of workshop leaders. In 2011, Ilana Cravitz of The London Klezmer Quartet was musical director supported by Susi Evans of She’Koyokh. 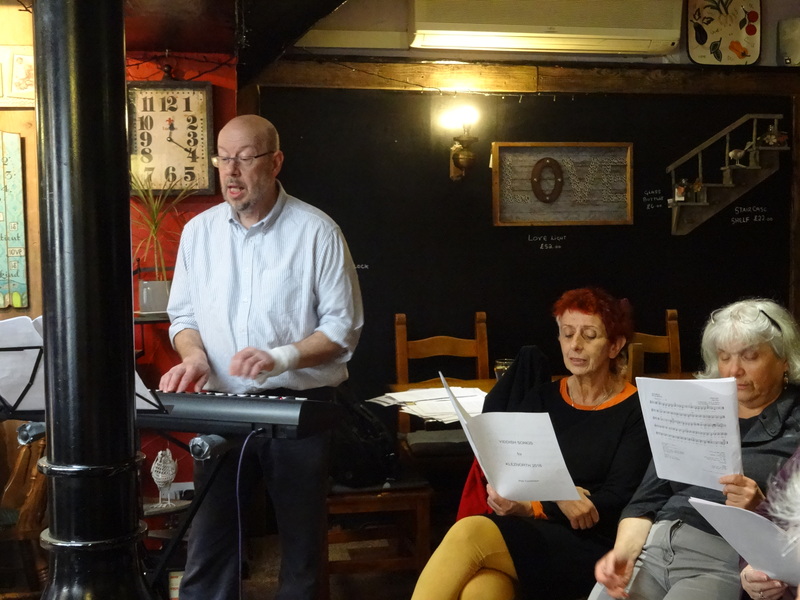 In 2012, Christian Dawid of Konsonans Retro from Germany and Rachel Weston, Yiddish singer and workshop leader joined us. In 2013 we went to town on visiting workshop leaders, with Deborah Strauss of the Klezmer Conservatory Band, coming over from the States, and a British supporting cast of Paul Tkachenko of the band She’Koyokh, Vivi Lachs of the band KlezmerKlub, and Rachel Weston for a second time. In 2014, Christian Dawid returned as Musical Director, together with Rachel Weston, Avia Moore, and a welcome surprise visit from Itzik Gottesman. In 2015 returning as Musical Director was Deborah Strauss of the Klezmer Conservatory Band, coming over from the USA, supported by French band Freylekhs Brider as workshop leaders for the weekend. In 2016 we were lucky enough to have not only the return of Ilana Kravitz as MD but the entire London Klezmer Quartet with Susi Evans, Indra Buraczewska and Frances O’Rourke. We were also delighted to have Andreas Schmitges join us from Germany. In 2017 we welcomed Deborah Strauss back to KlezNorth, this time with husband and musical partner, Jeff Warschauer (The Strauss/Warschauer Duo) . Deborah and Jeff were perfectly complemented by Susi Evans from both She’Koyokh and the London Klezmer Quartet. The musical direction of KlezNorth 2018 was shared by flautist Adrianne Greenbaum and tsimbalist Pete Rushefsky, both from the USA with all-round Klezmer superstar Michael Alpert – originally from the USA but now living in Scotland. The directors were supported by fiddle-player Gica Loening, also from Scotland. 2019 featured the return of Michael Alpert and Gica Loening and for the first time welcomed Merlin and Polina Shepherd with clarinet, keyboard and exquisite vocals. Each year starts as soon as the previous year’s KlezNorth is completed. The organising committee, Phil Tomlinson (chair), Judy Sherwood, Sue Cooper, Andrew Gardiner, Ian Stern, Keith Lander, Fiona Frank and Aisha Walker starts by reviewing the event. We then plan tutors and workshops for the next KlezNorth. The music, dance and song workshops are always supplemented with talks, films, a Saturday night “tish” , and other windows into Yiddish culture. The full range of workshops and workshop leaders will be announced as the programme is finalised. However, the most important contributors are those who come and participate, share, listen and learn. KlezNorth is the participants.